The Prop Den more a vader ref site. All very different in there own rights ,a shoe shop sells shoes so why so many on the high street ? I think i found the helmet on screen, tell me what you think, please. If the used pic's for reference are not Ok, tell me please and i will remove them immediately!! The eyes look to be trimmed very close to Simons helmet, but the helmet in the comparison resides in the LFL archives. Well, damm ...ok lets go on the hunt again. BTW, mhh... are this painted stripes in the teartraps under the eys? 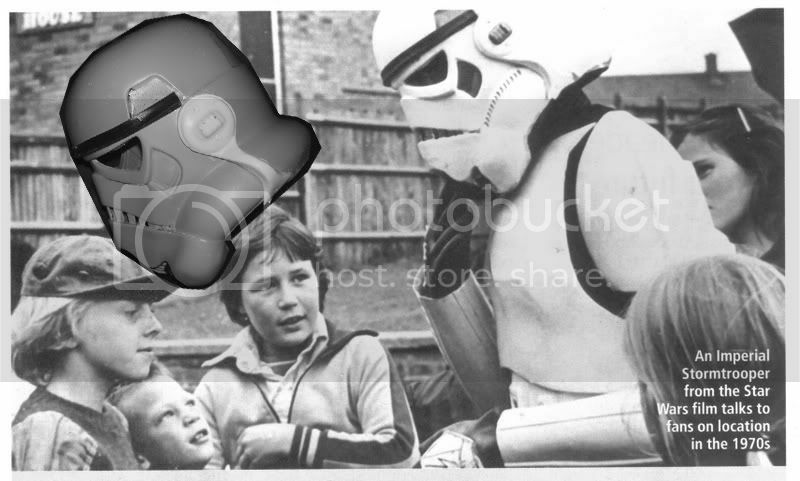 If yes it would be helmet from a Stormtrooper not from a Sandy. 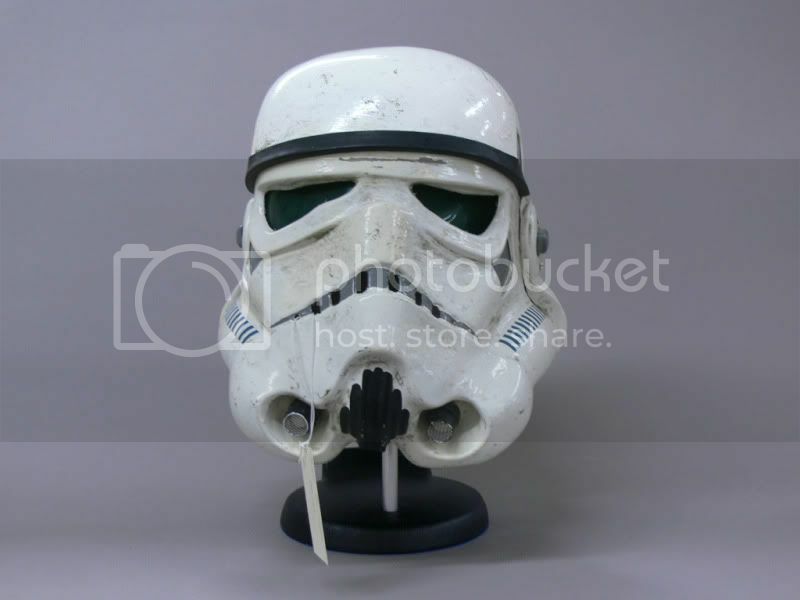 Than we search a Stormtrooper helmet and a Sandtrooper armor. Last edited by Turrican on Mon Mar 07, 2011 9:38 am, edited 1 time in total. It was a good effort Stefan, just not the helmet we are looking for unfortunately. Well is there something out there you not could find till yet?Are there green men on the Mars?? I'm sure you know it. Last edited by Turrican on Mon Mar 07, 2011 9:51 am, edited 1 time in total. I'll tell you why - sharing of information. Not all of us are the type to hoard LFL photos and then pm or email scraps of information to others who want to build an accurate suit. WOW, you found the Brian R and an ESB in that pile-up? Could you point them out? Are you mean this pic? The armor was made in white plastic. You can see the sheets behind AA in those pictures with the helmets. Here is the Brian R helmet in the middle of the stack of helmets. 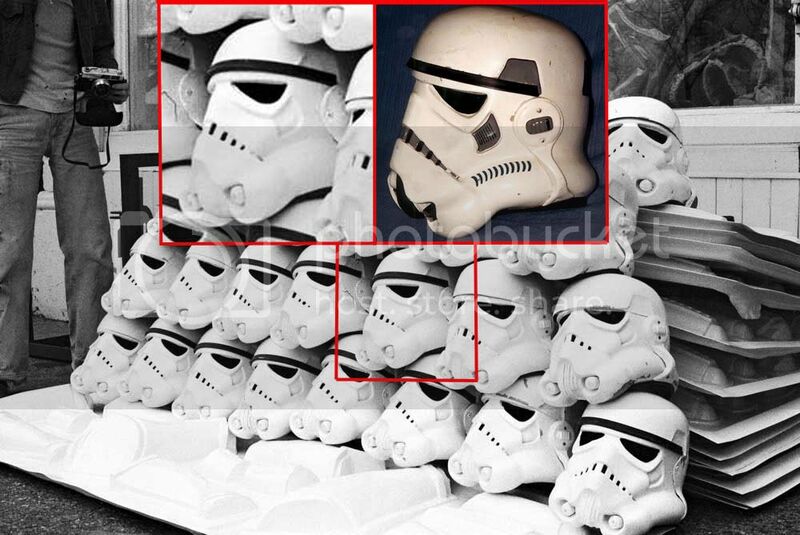 I am pretty sure the helmet to it's right is one of the found ESB helmets, I just need to find a better photo to compare it to. Cool. You have a sharp eye. Oh... and those aren't my pictures... they've been posted online for a long time. I have no clue who the original poster is. Wow. Looks like the BrianR to me. Nice find Paul. Are those HOVIs, but covered in masking tape? I think they`re what was used by Ainsworth originally , but the art/design dept decided against them , replacing them with Hovis for filming.